Always wear eye protection when working with electrical circuits and batteries. What is the difference between an A.C. rated and a D.C. rated fuse or circuit breaker? A.C. or D.C. - What is the difference? The most important parts of any alternative energy system are the safety devices. rated for direct current use. Please click here to find out why: A.C. or D.C. - What is the difference? What is the difference between over-current and short circuit conditions? an inverter, light, fan, telemetry equipment or pump) and the battery. Short circuit protection is a fuse or circuit breaker at the positive output of the battery. circuit on the battery positive and take the battery(s) out of the system. A short circuit on a battery bank can cause an explosion or fire. A fuse is a device that has a fusible (meltable) conductor (or link) between the ends. In an alternative energy or recreational vehicle system there are only three types of fuses to be considered. The smallest would be an automotive fuse. with connecting tabs such as an ATC fuse. These would be a good choice for lights and other small loads. the rated amperage to get it started. The picture above shows a three pole Class R block on one of our smaller pv systems. One fuse is between the photovoltaic modules and the charge controller. One is between the charge controller and the batteries. As the battery bank is small, I felt that the Class R fuse would have a sufficient arc interrupt rating. Notice the groove on the end of each fuse. This is a real "R" (rejection) block with a knife blade on one end of each pole. This is to prevent non-R (time delay) fuses such as Class M fuses from being used. pull them out without using a screwdriver or pliers to remove them. (on fuses of 100 amps or more). The filler helps to prevent an arc jumping inside the fuse body. A fuse has no moving parts and is pretty much unaffected by temperature variations. As a rule, fuses have a higher Arc Interrupt Rating than most circuit breakers. Some fuses have a time delay before blowing. What is Arc Interrupt Rating? A fuse can only provide protection once. They can not be used as a disconnect unless used in an expensive "bolt" pull box. fusing - the cost no longer matters. Above is a 300 amp Class T fuse in one of our 12 volt pv systems. It is in the Positive cable coming off the the battery bank. This system has eight Trojan T-105 six volt batteries wired in series/parallel. cover to protect the metal parts. This is a Class T fuse. 100 amp and larger have holed tabs on each end like the one shown. Fuses under 100 amps are cylindrical like the Class R fuses and fit in a similar shaped fuse block. They are either silver washed or tin plated for corrosion protection. A circuit breaker is a mechanical device that opens a circuit the amp draw passing through the breaker exceeds is rating. It will trip (open the circuit) in one of two most common ways, depending on its design. A thermal circuit breaker heats up when the amp draw exceeds is amp rating and then trips. A magnetic circuit breaker generates a magnetic field as the amperage increases to the point of the contacts tripping apart. A thermal circuit breaker is affected by ambient temperature, the higher the housing temperature is, the lower the trip amperage. A magnetic or magnetic/hydraulic circuit breaker is relatively unaffected by temperature. A circuit breaker can be used more than once. When it trips you can fix the problem and then reset the breaker. 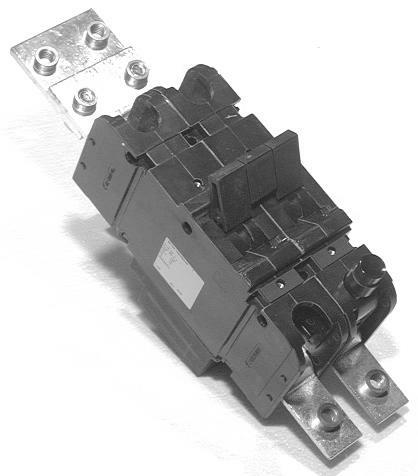 Some circuit breakers can also be used as a disconnect switch. Please note that the larger circuit breakers have limited life cycles. before they need to be replaced. Many circuit breakers have a short time-delay rating. 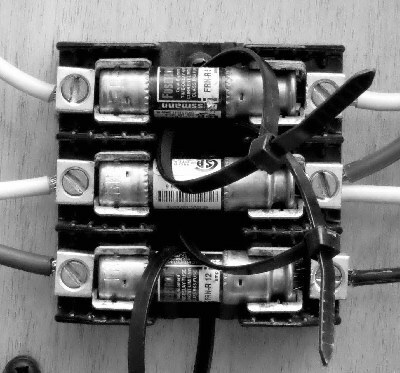 Circuit breakers cost more upfront than a fuse of the same amp rating. 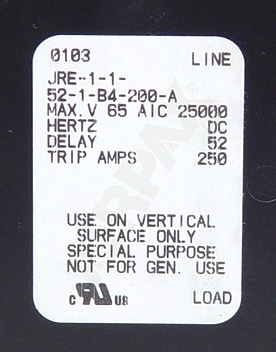 that of the same amp rated fuse. 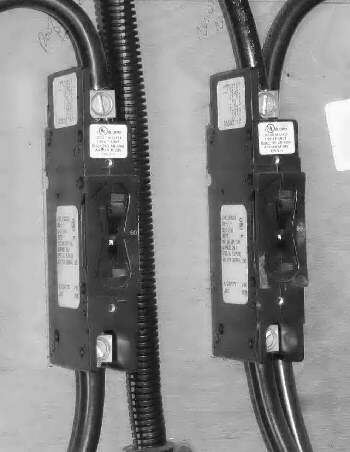 These are two CF 125 volt d.c. rated 60 amp circuit breakers. This system uses two Morningstar TriStar-60 charge controllers. to the battery bank (by way of a power distribution block and Class T fuse). if the need for trouble shooting arises without having to disconnect any cables. Alternating Current and Direct Current - what is the difference? per second in this part of the world. The flow of current changes directions sixty times a second. and be in the optimal position to break the potential arc. the lever was moved. Some of these switches would handle either a.c. or d.c.
are loud when operated - some of these have the letter "T" on them for tungsten rating. All of this comes into play in regards to over-current/short circuit safety devices. to circuit breakers in an alternating current system. When a direct current rated fuse blows it is designed to clear the arc and open the circuit. The same is true of circuit breakers. moved apart by heat and or magnetics and the circuit is open. tungsten mating surfaces) and swing apart faster and further than in an equivalent a.c. breaker. point of the swing actually gets in the way of a potential arc. or tripped. In this condition there is no protection provided. 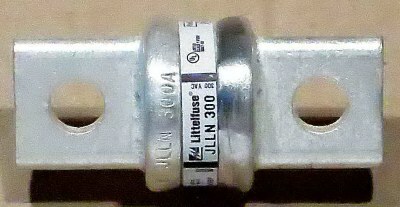 I am looking at a Littelfuse (yes, that is the correct spelling) JLLN 400 Class T fuse. It is rated at 125 volts d.c. with an Arc Interrupt Rating (current limiting) of 20,000 amps. It is also rated at 300 volts a.c. with an Arc Interrupt Rating (current limiting) of 200,000 amps. 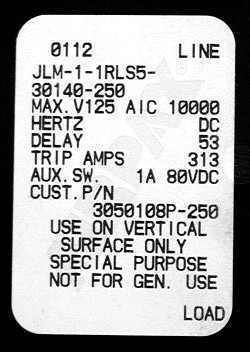 arc interrupt rating of 50,000 amps d.c. These two terms are pretty much interchangeable. These ratings give us an idea of how many amps a safety device can clear in a short circuit. Lets say you have a small sealed 12 volt battery rated at 10 amp hours. What if you have eight six-volt golf cart batteries wired in series or series/parallel. vaporized and the batteries can explode from the intense heat generated. continue through the device (jumping it) like it was a piece of solid metal. to clear a short circuit. Please click onto the image to go back to fuse ratings. 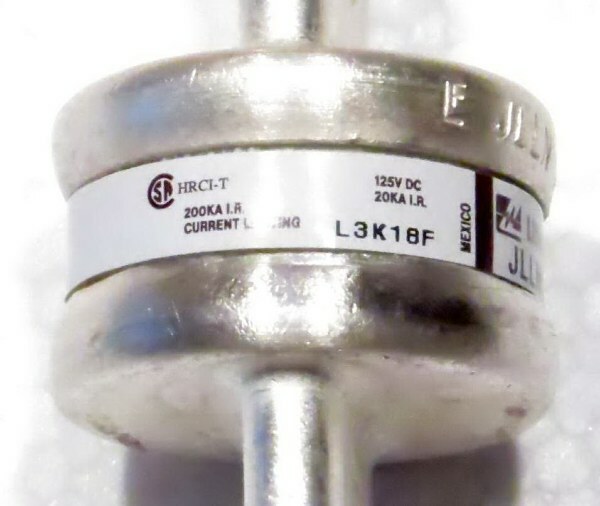 This Littelfuse 300 amp Class T fuse shows two Arc Interrupt Ratings. On the left it shows 200KA (200,000 amp) rating at 300 volts A.C.
On the right it shows 20KA (20,000 amp) rating at 125 volts D.C.
As a side note: some Ferraz Shamut A300 fuses are rated at 150 volts d.c.
and have a 50,000 amp A.I.R. rating. Isn't a circuit breaker good enough on its own? This question comes up more often than you may think. When it comes to protecting a battery bank, in most cases it isn't. 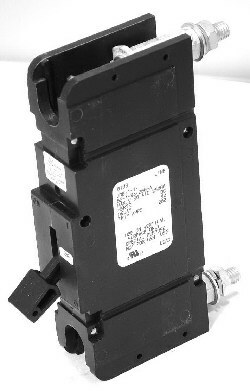 This is an Airpax 209 series CF (captive lug on top and bottom) circuit breaker. It is rated for direct current use up to 125 volts and has an A.I.R. rating of 5,000 amps.